Lieutenant Colonel Meyrick Eliot-Drake-Briscoe, a gift from the artist, and by descent. The present watercolour was given by the artist to Lieutenant Colonel Meyrick Eliot-Drake-Briscoe, an ancestor of the present owner. Eliot Drake-Briscoe was born in 1898 and spent his boyhood at Buckland Abbey the former home of Sir Francis Drake. In 1936 he moved to Norfolk where he lived for the rest of his life. Eliot-Drake-Briscoe met Harrison in the 1950s. He was a very keen bird-watcher and his house in Norfolk is now a testament to his two abiding interests: Drake memorabilia and pictures of birds. For further watercolours from this provenance, see lots 30, 94, 99, 101, 104, 109, 110, 135, 138, 158, 159, 168 and 182. Harrison studied and sketched birds as a young man, improving his knowledge of anatomy through the practice of taxidermy, and eventually studying at the Slade School. He made regular visits to Scotland to observe golden eagles at their eyrie and visited Iceland to study its birdlife and landscape. He illustrated S. Gordon, Days with the Golden Eagle, J. Delacour, Pheasants of the World and wrote and illustrated Bird Portraits. 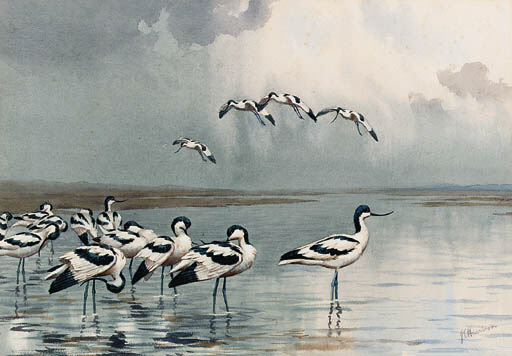 For many years he lived in Norfolk, where he continued to paint birds and support the Norfolk Wildlife Trust.